This weekend I finished the first season of the wonderful Netflix series Unbreakable Kimmy Schmidt. If you’ve been completely out of the loop, the series is created by Tina Fey and focuses on the story of a girl from small-town Indiana who was kidnapped and kept in a bunker for 15 years with three other women. They were held by an apocalyptic preacher-type, Richard Wayne Gary Wayne, who had predicted the end of the world on June 6, 2006 (666). He had convinced the girls that the world had, in fact, ended. So part of the shock of their rescue is that they’d been living in the bunker needlessly for years. Kimmy heads for New York upon release and while the show dabbles in “fish out of water” jokes, it mostly shows the resilience that kept Kimmy sane during her captivity. Many of my friends on social media have raved over Kimmy. There are aspects that align nicely with people who grew up in certain elements of evangelical culture (this piece by Alissa Wilkinson is one of the best). While watching the show, I found myself thinking of Leon Festin ger’s When Prophecy Fails. Festinger, Henry Riecken, and Stanley Schacter had become members of a small UFO cult operating in Evanston, Illinois and Lansing, Michigan in 1954. Given Festinger’s interest in what has become cognitive dissonance theory, it was a wonderful field test. The theory suggests that apocalyptic groups are open to cognitive dissonance because the possibility of disconfirmation is high. When the predicted event doesn’t happen, what does the group do? (Gerardo Marti shared this abstract from a recent article about Harold Camping). The 1954 UFO group held a press conference on December 17th and predicted that the world would end on December 21st. When I was in college, I got the Chicago Tribune microfilm and read all about the prediction. My favorite thing was the front page on the 22nd: halfway down the page was a small headline that read “World Still Here”. 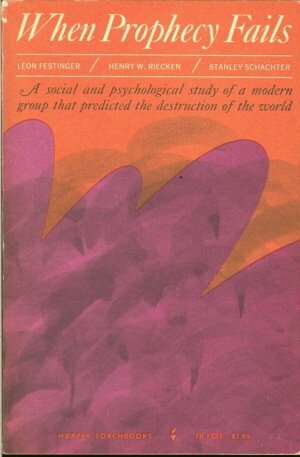 Festinger and colleagues had predicted that those members most invested in the group would have the highest degree of dissonance. Those on the fringe would simply abandon their beliefs (and try not to talk about them). But those who were true believers would either have to admit they were wrong or find some additional explanation (since the world didn’t end). The true believers argued that God saw their willingness to carry their message and face ridicule. He granted the world a reprieve due to their faithfulness. Watching Kimmy Schmidt made me wonder how the Mole Women (as the media nicknamed them) responded to their own disconfirmation. The women can be seen in the picture on the right (left to right: Gretchen, Cyndee, Kimmy, and Donna Maria). Here’s what I discovered (there are disclosures coming if you haven’t watched all of it yet). Gretchen is a true believer. She is always in her blue dress and she believes in Richard Wayne Gary Wayne until nearly the end. She relished her time in the bunker. Cyndee is a sort-of believer. She was committed while in the bunker, even if somewhat unaware (and protected by Kimmy). Upon rescue, she still identifies as a Mole Woman but milks it for all the benefits she can get. Donna Maria was never a believer. She was marginalized even while in the bunker, but she got back at people by pretending she didn’t speak English. 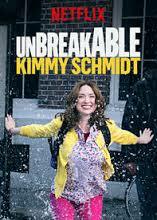 Once in New York, Kimmy changes her last name and doesn’t want people to know she was a Mole Woman. In one episode, she explains to another character than she learned that she could put up with anything for ten seconds. She counts to ten and then when she’s done counts again. This act of distancing keeps her on the periphery even though she appears to be the strong one of the group. But we wonder if she really ever believed the world had ended (a stray rat plays a critical role in the story). When Richard Wayne Gary Wayne comes to trial, she finally realizes that she has to go back to Indiana to testify. She doesn’t believe Wayne and sets out to prove that he’s a fraud. It’s not a perfect test of Festinger’s theory. In part, this is because Richard Wayne Gary Wayne isn’t really believable as a cult leader (at least as told through the flashbacks and his trial performance). 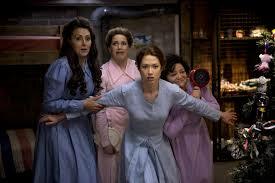 Plus, it’s a lighthearted comedy (even if it’s a story of kidnapped women). Kimmy’s behaviors do align with a lot of what we see in the sociology of religion. People who, on the surface, look like their buying everything being served up. But people who, in their own unique ways, are finding mechanisms to chart their own course and maintain an authentic sense of self.